Flaxseeds are rich in nutrients. Eating a nutritious diet rich in essential nutrients can help keep your hair and nails healthy. Although adding flaxseeds to your diet won't guarantee long hair and nails, these little seeds do provide some of the nutrients that are beneficial for this purpose, including omega-3 fats, thiamine and magnesium. Omega-3 fats help control inflammation, nourish your scalp and keep your hair growing, and make your hair more elastic and less likely to break. These essential fats also help the nail plate develop properly and keep your nails from splitting. Flaxseeds provide omega-3 fats in the form of alpha-linolenic acid, or ALA, with a tablespoon of ground flaxseeds containing 1,597 milligrams. The Academy of Nutrition and Dietetics recommends getting between 1,300 and 2,700 grams of ALA per day for each 2,000 calories you consume. Fatty fish, walnuts and soy foods also provide omega-3 fats. The B vitamins, including thiamine, are important for keeping your hair and skin healthy. Thiamine also helps limit stress, which is one of the factors that can cause hair disorders. A tablespoon of whole flaxseeds provides 11 percent of the daily value for thiamine, and the same amount of ground flaxseeds provides 8 percent. You can also get thiamine from pork, legumes, whole-grains and rice. Magnesium helps restrict the inflammation that could otherwise interfere with hair growth. Hair loss is one of the symptoms of a magnesium deficiency, which can also cause vertical ridges in your nails. Magnesium also helps limit stress, which can cause hair loss. A tablespoon of whole flaxseeds provides 10 percent of the DV for magnesium, while the same amount of ground flaxseeds provides 7 percent. Other good sources of magnesium include almonds, cashews, spinach, peanuts, black beans, whole wheat bread, brown rice, plain low-fat yogurt and avocado. Use ground flaxseeds, not whole. Whole flaxseeds can pass through your body undigested, and you won't absorb as much of their nutrients. Dietary changes will only affect new hair and nail gowth, so the effects may not be obvious for at least four to six months due to their slow growth rates. People with hormone-sensitive cancers, endometriosis or prostate cancer should speak with their doctor before using flaxseed, because it isn't clear how flaxseed may affect these conditions. Those with a narrowed esophagus or bowel problems may need to avoid flaxseed altogether; it could worsen these conditions. 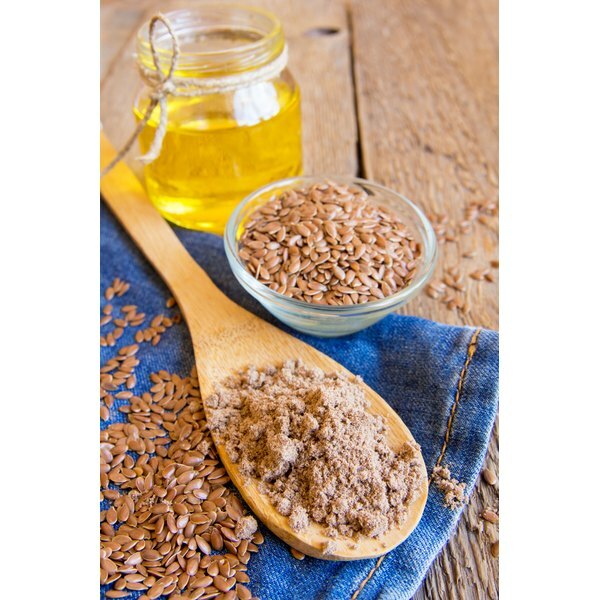 Flaxseed may interact with birth control pills, hormone replacement therapy, diabetes medications and blood thinners, so check with your doctor to ensure that increasing your flaxseed intake would be safe if you're taking any of these medications. Can Eating Healthy Food Change the Texture of Your Hair?